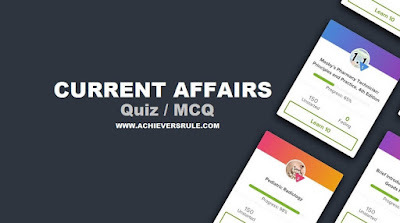 Daily Current Affairs Quiz for 9th May 2018 consists of 15 Questions which are based on the Latest News Headlines and are important for the upcoming examinations of Bank, IBPS PO, IBPS CLERK, SSC CGL, SSC CHSL and Railway. Aspirants can go through the Daily Current Affairs Updates and also the Static GK and One Liner Note Down Points before solving this quiz. Q1. Who is the cofounder of whatsapp? Q2. What is the rate of India's growing economy according to International Monetary Fund? Q3. Who topped US magazine Forbes' 2018 list? Q4. What is India's rank in the business optimism index for the first quarter of this year? Q5. Which ecommerce is being taken over by Walmart? Q6. which state has brought up the country's first Integrated Control and Command Centre (ICCC) for all seven smart cities? Q7. Which bank is going to provide loan to help National Nutrition Mission in India? Q8. Which team has signed an agreement with NASA to make flying cars a reality? Q9. Where has the UN Secretary-General Antonio Guterres announced a climate summit? Q11. What is India's rank in business optimism index for the first quarter of this year ? Q12. External Affairs Minister Sushma Swaraj is going on a two day visit to _________? External Affairs Minister Sushma Swaraj left for her two-day visit to Myanmar. Q13. Vice president have signed two agreements on exemption of Visas for holders of Diplomatic and Official Passports and in the field of Agriculture with which country? Vice President Venkaiah Naidu and President of Panama signed two agreements on exemption of Visas for holders of Diplomatic and Official Passports and in the field of Agriculture. Q14. Who has been conferred with 'WEF 2018' award?